Juhu Beach is a 2 minute walk from the Hotel. In close proximity to the Shopping districts and Night life of Mumbai & near to the International Airport & Business districts, is a perfect choice for travellers across all categories. Keep up with the latest news and events from us. We focused on delivering a memorable guest experience. The Emerald - Hotel & Service Apartments offers special deals to suit your holiday needs while vacationing in Mumbai / Bombay. Located on Juhu Tara Road, we are conveniently located in the heart of the most happening places of Bombay. Read what our guests are saying their experiences about us. Your feedback is of utmost importance to us. 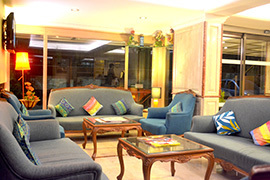 The Emerald Hotel & Service Apartments Mumbai is a first class hotel in Mumbai with 66 rooms. Centrally located and 5-minute walk from Juhu beach, it is also a great choice for travellers interested in beaches, nightlife and shopping for clothes. For your accommodation in Mumbai, all rooms at The Emerald Hotel & Service Apartments Mumbai features contemporary decor and include ergonomic work stations, high-speed internet access, and flat-screen TVs. The hotel’s restaurants feature international and authentic Indian cuisine, with many vegetarian options. The Emerald’s coffee shop is popular for its coffees, pastries and light snacks. The Santacruz railway station is 10-minutes from the Emerald Hotel Mumbai. Many of Mumbai’s top attractions, including the Gateway of India and the Kala Ghoda district are a short drive away. The Chhatrapati Shivaji International Airport is less than a 20-minute drive. Be the first one to receive our best rates and offers when you subscribe to us now!